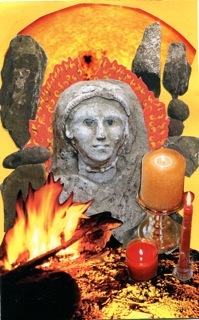 Brigid, Goddess of the Fire, greets us on Brigid’s Day, February 1. She is a Celtic sun goddess whose light burns brightly, illuminating the darkness of the land, of a heavy heart, and the dark night of our soul. With her shining light to guide us, we are lifted out of the Underworld darkness where we tend to descend in Winter, to the light of the World above, teeming with life as Spring begins to unfold her wet wings. Brigid is a beloved goddess throughout the British Isles, particularly Ireland, where she is seen as the Mother of the Land and Her people. As a feminine archetype, she activates our solar, active nature. Much like the sun rising from below the Earth’s horizon, she urges us to come out of hiding and shine our light on the world. This may be done in a quiet manner, such as sitting by the hearthfire and doing needlework, finding inspiration by a walk in nature and writing a poem, moving about the kitchen making soup, getting busy with an art or craft project, or in big ways by taking on new roles as healers, artists, and leaders and calling others to join us. As a Triple Goddess she fires her arrows of inspiration (poetry, writing, arts and crafts), healing (the fire of life within our physical bodies), and smithing (fire of the hearth and home and the alchemical fire of change) right into our hearts, igniting us to action. In her shadow aspect (the unlived part), she represents feeling stuck in the underworld darkness, unmotivated, uninspired and immobilized — perhaps an unwillingness to claim or give life to a latent creative talent. Keep in mind that being in the darkness of the Underworld or cave of winter can be by choice — a longing to rest, hibernate and gestate — or by an unconscious process that draws us down. Activating Brigid in her light-bringing aspect helps us move out of this dark and quiet repose when we feel ready or inspired. Sometimes the very act of going outside and doing things in the world, particularly creative activities, helps to awaken us and move us out of a rut. Saint Brigid is said to have been born at the crack of dawn in the threshold of a doorway, both representative of liminal states of being — of this world and not of this world. Because of this, in her Triple Goddess power, She represents the mediating force of standing between two opposites and holding the tension, e.g., pagan/Christian, freedom/slavery, rich/poor, upperworld/underworld, fairie/mortal, fire/water, goddess/woman. Brigid grew up to be a strong-headed young woman who bucked authority, including her own father as well as the Church Fathers. This is part of her archetypal energy: the rebellious daughter and fierce leader who speaks up for what she believes in and does not submit to patriarchal authority. She rebuffed her father’s attempts to arrange her marriage when she came of age. She knew that she had work to do. One legend tells of how she went to the bishop to ask for land to build an abbey. The bishop scoffed at her temerity and said he would grant her as much land as her mantle could cover. Apparently he didn’t realize the extent of her abilities to create plenty, because when she spread her magic cloak, it covered many acres. The bishop had no choice but to grant her the land on which she built her abbey, and so she became the first abbess of Kildare. So great was Brigid’s compassion, miraculous healing powers, and ministry to the poor and weak that she was ordained as the first female bishop. However, she did not reject the old forms of worship and devotion and so was a living bridge between the Old Religion and worship of the Goddess and the worship of the one Christian God. For many years, Her abbey at Kildare was a school that preserved ancient knowledge and the old crafts of which the Goddess Brigid was patron. St. Brigid herself became a focus for the veneration of the Divine Feminine, particularly by Gaelic women, and indeed by women across the British Isles and throughout time. The Catholic Church, which had conflated the Saint with the Goddess to appease the people who loved Her, removed St. Brigid’s Feast Day from the calendar in the 1960s, however they did not decanonize her. Although they reduced her status to an Irish-only saint, they did not diminish Her in the hearts of the people. She holds equal status with St. Patrick as patron saint of Ireland. As Triple Goddess, She is guardian of the blacksmith’s fire, the forge in which metal is shaped and transformed, much like the alchemical fire that transmutes base metal into gold. The blacksmiths were considered a type of alchemist and wizard in ancient times. As a patron of this art, Brigid helps us transform our darkest fears and doubts into love and strength. She helps us see things in a new light, to move out of the pain and suffering caused by our fixed way of thinking and to perceive things with a different perspective. As a healer, She stirred the cauldron of plenty that made the healing elixirs and soups that brought people back to health. One of her miraculous powers was that Her pot was always full and never empty. The poor and hungry knew they could always have a bowl of soup or cup of milk when they went to Brigid for help. It was said her cows gave milk four times a day. Whatever food was needed she made appear. In this way, She is a goddess of fertility and abundance who reminds us that we always have enough, indeed, that we always are enough. Happy St. Brigid’s Day! I like this woman who I’m just coming to know. Happy Brigid’s Day to you, dear combrogo. It is good to see you here. Beautiful post! Thank you, Combrogo! I feel a kinship with Brigid as Aquarian priestess with Scottish ancestry, not to mention my soul connection to Maeve. Thanks for telling us the story of Brigid. You are welcome! Brigid’s story is our story, of how we awaken and do good work in the world. OK, I’m curious, what is a combrogo? Welsh for companion. The Celts called each other the companions. I really like this concept of the “cauldron of inspiration”! Yummy! Yes, Nancy, we need Brigid’s fire and light to get us through the end of winter! Oops, this went in the wrong place. It was a reply to Nancy, below. And yes, nmr, the cauldron of plenty is the cauldron of inspiration, good to always keep on a low flame so we can turn it up whenever we need to. I love how you skip back and forth between the Goddess and the Saint as if they are the same being(which personally I believe they are). A Goddess we can sink our metaphorical teeth into. Wonderful Post! I’m curious too…what is a combrogo? I’m sure, Elizabeth could explain this so much better and can add more, but in her wonderful Maeve Chronicles, the combrogos are the band of fellow/sister travelers and revelers that surround Maeve Rhuad through time and space. I’m not sure if the word comes from Celtic/Gaelic or Latin. Elizabeth, enlighten us! Thanks, Carrie. It is hard not to skip back and forth between the goddess and the saint because they have been so conflated it’s hard to know where one begins and the other ends. The woman saint with magical powers or the goddess incarnate who walks the Earth. That’s what I love about her: she is Goddess/Woman, like we are. Another wonderful post about “Imbolc” or “Brigid.” This is not the easiest time of year for me — I often say February is the longest month of the year here in snowy, cold Wisconsin, especially this year!!! — so inspiration from the Goddess of fiery inspiration is very welcome. thanks, Stephanie. Yes Nancy, I too feel that way about February since I’m hunkered down in NY way up by Lake Ontario. But I noticed last night that the western sky was still light after 6 PM. The fire of hope as well as inspiration! Yes, as a fellow Wisconsinite I agree…and if March is the same way it makes it even more difficult. No wonder I did not hear a lot about her during my school years (all of them in Catholic schools!) I like this woman! One of my favorite things to do to honor Bridget is to have a hot tubbing or bathing ritual. As she is the Goddess of both smithcraft/fire, holy wells, and healing, that equals hot water soaking to me. February 2nd is also Inannas Day. Another Goddess who enters the land of the dead and returns as more, more whole, more complete. She is a sacred mirror of our own letting go of who we think we are so we can become who we are meant to be. Thank you, Francesca. I didn’t know February 2 was also Inanna’s day. 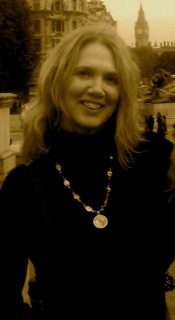 I am doing a goddess e-course and both Brigid and Inanna are the first two goddesses we work with. Along with Brigid, I have been feeling Inanna’s presence and archetypal energy quite strongly. Perhaps that is why.